Before we begin with this giveaway, the winner of my Marilyn: Intimate Exposures giveaway is Kim from Midwest Musings. Congratulations! Please email me with your mailing address. Mrs. Depew Vintage specializes in vintage sewing, knitting and crochet patterns. Her amazing PDF patterns have become very popular in the vintage sewing community but she also offers a variety of paper patterns in her etsy shop. She just launched her brand new website, mrsdepew.com where you can see her full line of patterns, ebooks and get updates on her newest additions. I recently finished her 1950's one-piece bathing suit pattern and I used her 1950's beach bustier for my tiki dress! 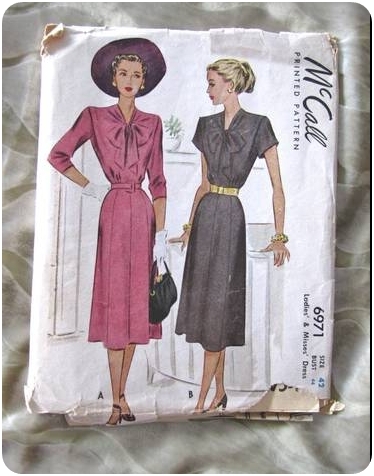 "McCall's 6971 from 1947 is a printed pattern for a Ladies' and Misses' Dress in a wearable size 42 with a 44" bust and 36" waist. The dress includes a front bow-tie, shoulder pads, an optional belt, and short, three-quarter or long sleeves. The envelope may show some wear and tear but this little gem has in-fact never been used and is still in its original factory folds." The giveaway will run for one week and the winner will be announced next Wednesday. I love those shorts. I've been having my eye on that dress featured in the giveaway for quite sometime now. It's just so lovely! This giveaway dress pattern is beautiful. I love your blog and read you every day in my Google Reader. Thanks for sharing your wonderful talent! Ooooo wee! Would love to win this - need to have a go at something new!! My bestest pattern from the shop it the Teddy Combination Undergarment: http://www.etsy.com/listing/79297402/vintage-sewing-pattern-lingerie-teddy . I would need to size it up - but oh how I long for a proper teddy! I don't think I can pick just one! Her 1930's French Night Gown is fabulous and I love her 1940's Turban Rosette Hat. I love ALL Mrs Depew's patterns, I'm just crazy for them. With an eye on my autumn/winter wardrobe, I love this blouse, I think it would look fantastic in a lamé for Christmas parties! I love this top: http://www.etsy.com/listing/89526191/vintage-sewing-pattern-ladies-1950s. It's the sort of thing that I love but forget to make because of all the distracting adorable dresses in my sewing queue. The giveaway pattern is actually my size--decent plus size patterns are so hard to come by from that era, I think I'd probably trace it off and pass it on. I have a sweet pink and white checked cotton in my stash that would make an awesome beach outfit. It's so hard choosing a favorite since all her patterns are wonderful. I'd love to try and make this suit! http://mrsdepew.com/beach-patterns/one-piece-bathing-suit.html You can never find any cute suits like these, that's why I don't currently have a swimsuit. I'd probably try a cute navy and white polka dot print. It just looks super cute no matter what! Oooo - thanks for this giveaway! I love her patterns and am in love with a few, but the 1930's negligee is DIVINE!!! oh that pattern will fit me perfectly! i like the French Draped Blouse, although most of the lingerie is so pretty too. The swimsuit and Tiki dress are darling! I'm a big fan of Mrs. Depew's lingerie patterns. I have yet to actually buy one, but I adore them all the same. The French Pin Up Bra and the 30's Negligee are at the top of my list! Thanks for holding such a nice Giveaway, I love your blog and tutorials and read every post. I'm thinking about saving up a little money to buy all of her E-books and maybe some patterns. 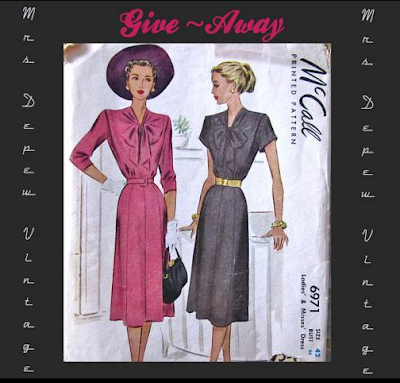 The 1947 Giveaway pattern looks so lovely, I adore 1940s dresses :). I would love to make the 1950's Style Cloche Cap 'cause it's very hard to find nice, old hats in Germany - so i could make it by myself. Thank you!!! I sent you an e-mail! I am so excited!!! It's hard to chose just one but after seeing your one piece bathing suit you recently made I've been wanting to make a red one with white poka dots. I would love to win that dress pattern too! My favorite pattern is the 1930's French Pajamas. I've been looking for an elegant PJ pattern! Oh my. 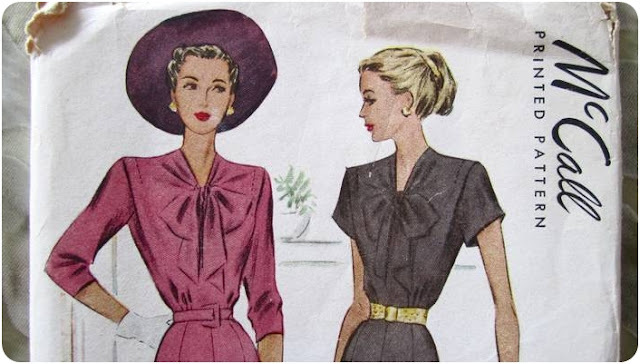 My absolute favourite is this dream blouse http://www.craftsy.com/pattern/sewing/Clothing/1950s-Style-Draped-Blouse-3007/18974. I am going to purchase it for sure. Thanks to your blog I found this perfect blouse.